Hugo Or Paulo? Is It Time To Pass The Mantle? Being captain is neither here or there. He has to be good enough to be 1st choice. For us to play a high line, Hugo has to play - simples. The keeper is the very very very least of our worries. The only way the keeper becomes a problem is if it impacts the defence and their confidence in him... clearly that isnt the case. Look I’m not a football scout and I don’t watch any non premier league games so I won’t be able to come up with 10/15 names but to think we couldn’t attract a keeper to perform better than Lloris has for the last few years is not correct imo. We have consistently been the 3/4 best team in the league for the last few years, is Lloris the 3/4 best keeper in the league? 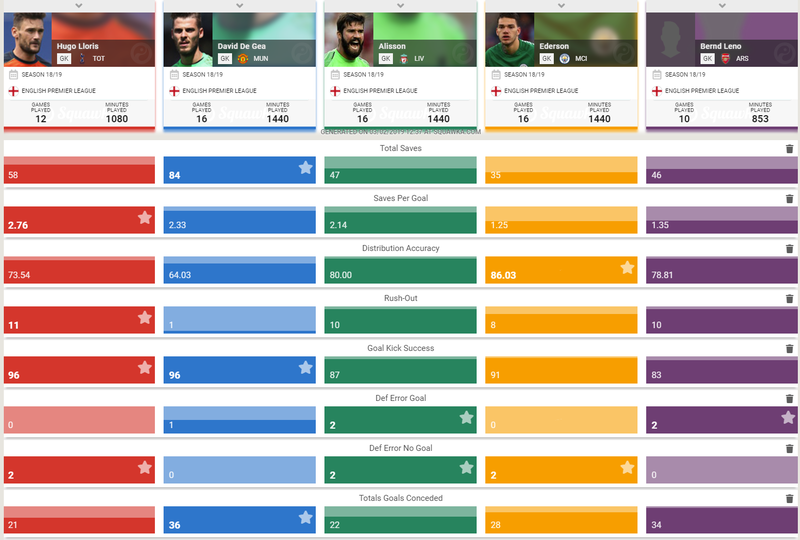 I don't think based on Gazzanigas 10 games for us that he'd challenge Hugo in any of these categories apart from maybe distribution accuracy. Have a look at David "The best keeper in the world" De Geas distribution stat by the way. Can't wait for Ederson to be properly tested as a GK. Normally he is just distributing play in a team winning 5-0. He's like Victor Valdes. Agreed but how do we afford even a second rate keeper now Chelsea, Liverpool and city have spunked more money on a keeper than we have net spend in 10 years. I think a top quality right back would improve our defence. Let’s be honest Pochettino is not going to buy a replacement for Lloris anyway. Like Neuer, ter Stegen or Navas I guess. Well, you will continue to wait, because Hugo happens to be the best goalkeeper on the world and hes also one of the most consistent one. Till then, i'll keep bring this thread up every week to remind you of your foolies. Look everyone knows on he's day Lloris is world class one of the best however he does let himself down at times. Let’s himself down? Maybe off the pitch he did, but not on it. It is actually ridiculous how consistent he has been over the years. Yes he has made mistakes, every keeper does, but they have been pretty rare. Baffles me the criticism he gets. To hear you think he ‘lets himself down’ actually made me lol. The Leicester fans gave Lloris a loud "You're s#*t ahhhh" today. Made me laugh out loud as the current World Cup winning Goalkeeper captain had saved a penalty and made a string of good saves in the game. MoM today IMO - he has been through a slight dip in form of late but a great performance today. His game has been of a very high level all season. He's made a few errors and we take his brilliance for granted. Statistically speaking this has been by far his best season for us, and we are facing a lot more shots than in previous seasons, probably because we have been forced to rotate the defense a lot. He will make mistakes, as would any keeper being asked to play his role. Keepers we could get to challenge him? Navas? He is a decent keeper but would be fit to clean lloris' boots particularly has he is not suited to the pl style. Pat Jennings says Lloris is the best keeper he has seen at spurs and probably the best in the league. I think his opinion outweighs anyone here, so maybe some of our fans aren't quite as smart as they would like to think. Hell of a lot better than that Chelsea keeper after yesterday. Who's he ???? Competition is healthy? Who would have thought.. I think we should look to swap Poch for Ole and use the same arguement. And he’s absolutely right, all keepers make mistakes it’s a given - all the so called trendy keepers do. Cannot honestly believe Loris has actually been questioned, one of the very best in the world!